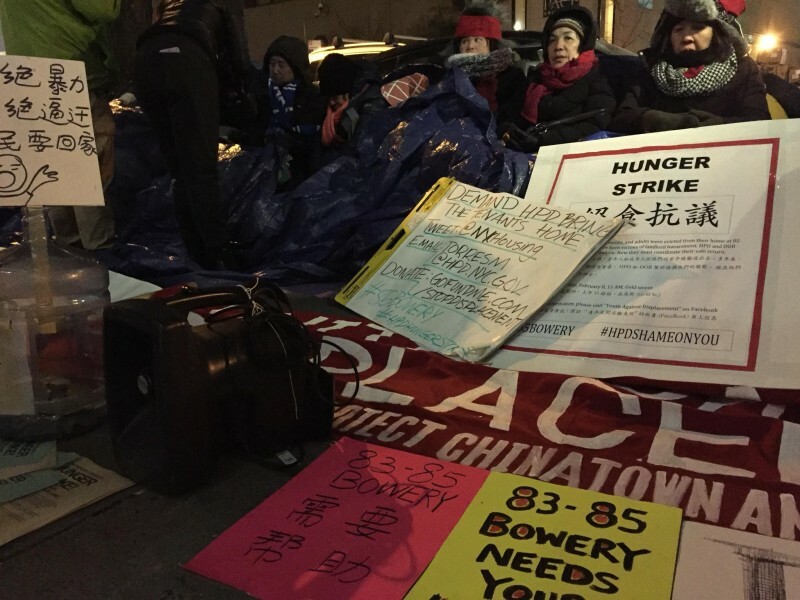 New York tenants’ hunger strike against displacement | Fight Back! 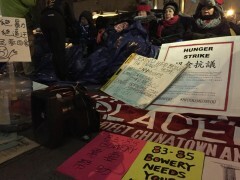 New York, NY - On Feb. 11, a group of over 100 people gathered in front of the New York City Department of Housing Preservation and Development (HPD) for a vigil in support of hunger strikers, who were among those hit by a mass eviction carried out by landlord Joseph Betesh. The vigil, organized by Youth Against Displacement, Coalition to Protect Chinatown and Lower East Side, and others, put forward the demands that HPD stop colluding with the landlords, take over repairs if the landlord fails to meet the deadline, prosecute Betesh for not repairing the building, and bring the tenants home by Chinese New Year. The common themes of the speeches were about the gentrification of Bowery and New York City as a whole. The process of gentrification in New York City has pushed out working-class and poor people, particularly oppressed nationality people. Under the guise of making the city ‘safe,’ existing tenants, many of whom have been living there for generations, have been pushed out of their homes to make room for developers to build luxury housing and open up new businesses. In the case of those evicted at 85 Bowery, the tenants were predominantly Asian American. As of now, the hunger strike has been put on hold until further notice. If the tenants’ repairs are not fixed by March 28, then the hunger strike will resume.